Parts of the landmark 1937 River Oaks Shopping Center are in danger of being demolished by owner Weingarten Realty Investors to make room for a chain book store and a high-rise residential building. Targeted for demolition are the architecturally significant curved wings facing Shepherd Drive and the 1939 River Oaks Theater. The Art Deco-style Alabama Theater Center at Shepherd and Alabama, which now houses a Bookshop and other retail stores, is also being considered for demolition. The demolitions would be a major loss for Houston. River Oaks Shopping Center was part of a development that served as Houston’s first auto-centered, suburban shopping center and was one of the first such developments in the country. With its largely unaltered examples of Art Deco construction, River Oaks Shopping Center is significant both architecturally and historically. 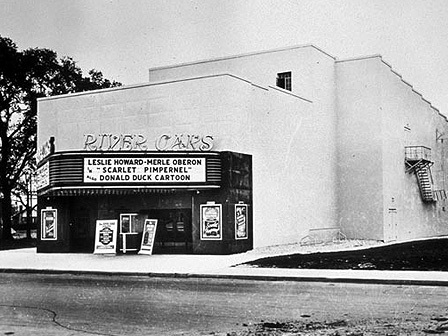 The 1939 River Oaks Theater has been in continuous operation since its opening and is Houston’s last remaining historic theater that still shows movies. The center and the theater are examples of late-1930s Art Deco design and are among a handful of viable retail buildings of their age and style in the city. Demolition could begin this year.